Weekends from the last weekend in Nov to Christmas Eve. Cotswold Farm Park is owned by Adam Henson from BBC Countryfile, perhaps the most well-known farmer in the UK. Meeting Santa at the farm park is a fun and relaxing experience with lots of time spent chatting with Santa. Tickets must be booked online in advance. Other tips can be found here – Top tips for visiting Cotswold Farm Park. For a completely unique experience head under earth to Clearwell Caves in the Forest of Dean. The caves were originally mined for iron ore and now operate primarily as a mining museum. We really enjoyed following the seasonal story trail and meeting the jolly Santa underground in the caves. Again my boys enjoyed selecting their own gift from a stall located next to Santa’s grotto. Make sure you give yourself enough time to browse through the underground Christmas stalls and enjoy a hot drink with homemade cake. Adults £12.50, children 2 – 14yrs with present £12.50, baby under 2 with gift £5.50, under 2 with no gift free. Cattle Country is a popular all weather attraction who know how to put on great seasonal events. (We’ve just recently been to their Halloween event and it was exceptionally good). Take a tractor ride to see Santa in his festive farmyard. Pet the animals and visit Santa in his Farmyard Grotto where every child receives a present. £14.50, Toddler 2-3 – £13.50. I’ve heard great things about this event from local friends. It’s something a little different too. 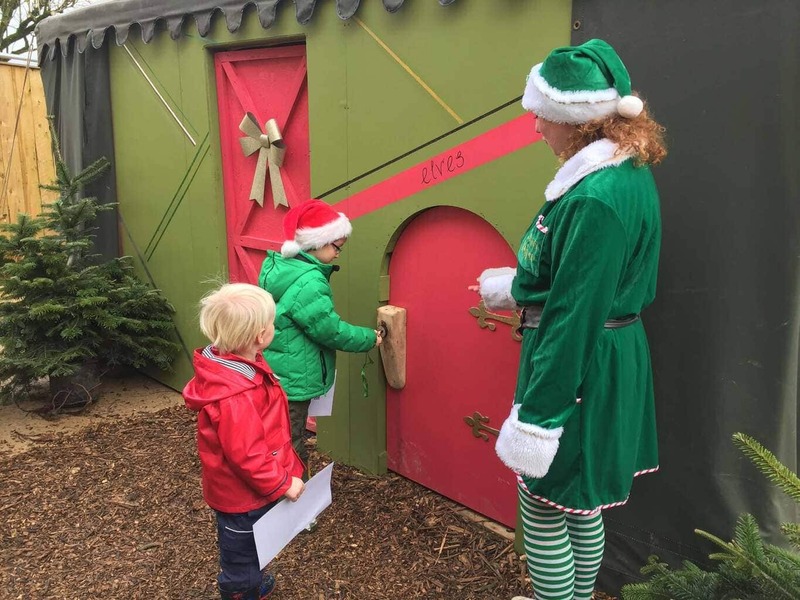 Blurb from their website – ‘For a unique Christmas experience, collect a magic badge and come into our cosy Carriage Shed Theater where the children sit around a fireplace. Enjoy breakfast or afternoon tea with the elves and visit Santa in his magical grotto. Ice your own gingerbread man, build an elf den, toast marshmallows, get creative making arts and crafts – and don’t forget to send a letter to the North Pole from the post office! Various prices from £6.95 to £19.95 depending on whether you opt for Grotto only or Breakfast/Afternoon Tea with the elves. Check out WWT Slimbridge website for more information. Thanks to Lisa from Travel Loving Family for this round up of the Best Places to see Father Christmas in Gloucestershire 2018.